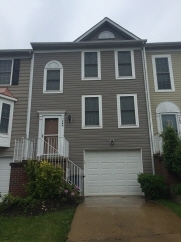 GORGEOUS 3 BD 2Fba 2 Hba in Leesburg. convenience to Rt7, Rt15, Dulles Greenway, shopping, dining & entertainment. Kitchen has granite countertops, cabinet space & custom backsplash. French doors lead to spacious deck & fenced in yard w/ patio. Mbr has walk-in closet & Mba w/ tiled shower w/ river rock floor. TLC has been given to this home & it shows, so don't miss out!